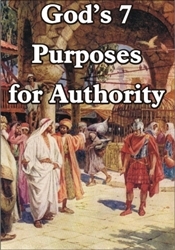 Generally speaking, we don’t see authority like God sees authority. One key definition of faith is that it is the wisdom to see that God works through the authorities He has placed over our lives and the decision to trust Him to do so. The centurion was a man in authority, but he wasn’t concerned with the authority he had nearly as much as he was the authority he was under. Produces power which produces results. Restrains wickedness with fear and brings protection. Brings blessings we could not have otherwise. Brings deliverance we could not have otherwise. Makes us effective in doing God’s work. Protects us from falling under the control of wrong authority. Very important to our youth.